Classic Rotary Phones: Repair, Refurbish, Restore Vintage Telephones » Blog Archive » Why won’t my phone ring? Why won’t my phone ring? Yesterday I was in a discussion about all the information that can be drawn from the various types of website statistics programs. Most “webmasters” (I hate that term) are familiar with one or more of these statistical generators, Webalizer being one of the more popular. These programs, typically run/updated daily, show the number of visitors and “hits”, as well as where the visitors came from. The volume of data they compile is staggering. Much of it isn’t of interest to the average guy that operates a modest personal site, but one part that I personally attach great importance to is the “search strings”… the words and phrases that people typed into their search engine of choice (usually Google) that ultimately sent them to my site. I’ve studied these search phrases for years on my other websites, and it has helped me to groom the content of the sites to more accurately address the things that my visitors seek. ClassicRotaryPhones.com is new, but has been quickly indexed by Google. What do you suppose people are looking for when Google sends them to this site? It’s invariably something along the lines of “my phone won’t ring”. As you may have read in a previous post, I’ve recently dealt with that issue myself. Perhaps this is a good time to address the subject in greater detail…Malfunctioning ringers are a common ailment of old telephones, which is somewhat curious given that they’re practically indestructible. Nevertheless, electro-mechanical devices can suffer various indignities in the decades following their manufacture, many succumbing to the careless tampering of a previous owner/repairman. I will take a moment now to remind everyone that I’m not an expert. I could enter a lively discourse on the validity of information on the internet, but I’m going to just say that, as with all “webmasters”, I’m just someone sharing their opinion. Some are experts, some are not. I’m not trying to pass for an expert, but I still might be able to help. That’s it for the disclaimer! So what’s keeping all these phones from ringing? If the phone is making a sound, but not the authoritative ring one would expect, the odds are strong that the problem is mechanical in nature. The quality of sound that emanates from the ringer is dependent upon the spatial relationship between the clapper (the striker) and the gongs (bells). Ideally, the clapper will not quite contact the gongs when moved (by hand) to the extremes of its travel. Something like a 1/16th” clearance is about right. 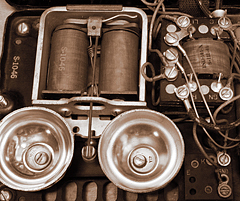 This spacing can be adjusted on the Western Electric Model 302 by loosening and rotating the gongs. (Clever, those W.E. folks, drilling the mounting hole in the gongs off-center.) The model 500 was the first W.E. telephone to have adjustable volume… you did try adjusting the dial on the bottom, didn’t you? But what if your phone isn’t making even the slightest sound? Remove the housing (the body of the phone) and, using your cell phone (newfangled things…) call the number your old phone is connected to. Note: Look at the ringer, but don’t touch, as the current passing through the ringing phone can deliver a nasty shock. Watch for any visible activity. Is the clapper moving, even a little? If it isn’t, then your phone is probably suffering from the most common malady to inflict non-functioning ringers… it is wired incorrectly. Wiring diagrams for the various vintage telephones are plentiful on the internet, and I hope to compile them here one day, but in the case of the W.E. 302 we need be concerned only with two wires…black and red. Black goes to “K” and the red wire goes to “L1″. In the case of my phone, the red wire went to “GND” (ground). I can’t say why so many ringers seem to be disabled in this fashion, but I suspect that many were purposely disabled by, or on request of, the subscriber. I hope this got you going! Hi, I have a W.E.302. I’ve updated the power cord and when I plug it in I hear a dial tone, but I can’t dial out and when I hang up the head set it does not close the line. When I unplug the cord from the wall that then closes the line. Everything looks to be wired right according to wiring diagram found on the internet. Any suggestions? Mark, Thank you for referring me to Dennis and giving him the heads up with my problem. Man, that guy is good. After a couple of tries and him unconfusing me, my phone is now 100% operational once again. I don’t remember if I told you that this house is the only house that this phone has ever lived, and for it to be used once again in our house is really cool. Our house was built in 1940 and is still 90% original. We bought it back in 1993, and that’s when we found the phone in a cupboard in the garage. The couple before us were here 45 years (friends of my wife’s family) and the original owner was a friend of theirs an elderly man. It was my pleasure to help you get that telephone ringing again! Believe me, I know how frustrating it can be (when it won’t work) and how such a simple thing of finally getting it to work can bring a smile to one’s face. I didn’t learn what I do know without the help of several collectors. I’m just passing on what others have given me. That phone will be ringing for another sixty years! Thank you for the kind words. After reading how you resolved the problem of Dan, I hope you can resolve mine. I have a AE 1A Monophone and I can get a dial tone, dial in and out no problem, but two things: when I hang up it does not close the line and dialing in the sub set ringer moves slightly but will not ring. Can you help, It’s making me nuts! The issues with your phone could be a result of a couple of things. With the popularity of VOIP (voice over internet protocol) telephone service, that has to be the first thing that comes to mind when I read that a phone will not dial an out-going call. Most VOIP services do not support pulse dialing. There is a device that can be easily installed in to your phone that will convert pulses to tone. With regard to the ringing, most phones of this vintage will ring on a VOIP line. Generally it boils down to improper wiring. The phone may have been originally wired for party line ringing. Often people tinker with the wiring and then the phone is passed on to the next person. We should be able to get the telephone to ring again but the current wiring must be examined. Mark will contact you with a direct e-mail address in which you can contact me and we can start trouble-shooting your issue(s). Thank you Allen for the question. I will look forward to hearing from you soon. BrianC, thank you for posting that link!!!! I had bought an old rotary phone on eBay and the ringer didn’t work. I took one look at that diagram, and fixed it in less than 5 minutes. Thank you as well, Brian C. It took me a little longer than Jeff (I had to borrow a screwdriver), but that is the first time I have heard a rotary bell (or talked on a rotary phone) in at least 20 years. Great sound - it freaks people out. WOW!!! 2 hours thought I was going to loose my mind!! My wife found your link, 3 minutes it was fixed!! You rock!!! Glad we could be of help, Vinny. Thanks for stopping by Classic Rotary Phones. Now I am a rookie here but don’t a lot of these old phones require the ground to ring. Older homes had telephone wiring with a ground I think. Today they don’t. Changing the wiring to what one of the previous threads said (bridge wiring?) I think will make the phone ring. Hi Mack, thanks for dropping by Classic Rotary Phones. The phones do not have to be grounded to ring on today’s lines. Let’s assume you’re using a POTS line (plain old telephone service). The only two wires that are needed are the green and red wires. Of course each telephone is wired differently, but in a standard Model 500, red to L2 and green to L1 will make a ringing phone—unless there isn’t something else going on—like the phone having a frequency ringer that used to ring on a Hz other than a 20hz line. Also if the black ringer wire was originally placed on the G terminal it must be moved to the L1 terminal. The black wire can be left on the G terminal but then the yellow and green mounting cord wires must be connected together at the wall. There has been much discussion about this on the Classic Rotary Phones Forum. Stop by and take a look. Better yet, log in and join the conversations. Thank you Rod for the updated information. It’s always good to hear from someone like yourself that spent a life-time working on these phones. I appreciate the education! Hi all! First of all, this is a great site and forum, so nice to see all these rotary phone enthusiasts like myself! I too have to thank Brian as well for the link, I bought a rotary a few days ago, everything worked but the ringer, I followed the picture in the link and voila, I now have a 1948 ring! Thanks to all of you for making that happen! Love this site! Take care, all and enjoy your phones! Thank you Kim for your comment and compliment. We’re glad your phone is ringing now. Nothing like hearing that sound on your phone again after so many years. Just about anything you ever wanted to know regarding Classic Rotary Phones.